So what have we been up to? Nothing board game related. Project deadlines fill up our nights and the moments when we can play board games have become quite a luxury the last few weeks. Boooo! So nothing new in our board gaming life. We did play Marvel Dice Masters again, which has been quite a while. It’s still a fun game, although I sometimes tend to overthink my actions which makes it more of a ‘thinking’ game than it needs to be. Returning to the tabletop café subject. Our FLGS serves coffee, tea and drinks and has a lot of demo games which you can play at the store, but it isn’t a real board game café. To be frankly, we actually don’t have any ‘experience’ when it comes to board game cafés, so we’re interested in your knowledge and experiences! boardgames and anny drink tend to not go togehther well. the point being what if someone hits a glas over the boardgame. unles you have special tables where the drink is stored not on the actual gaming survace its gona be a problem annyway. eindhoven could be popular, as far as i know there is a relative big boardgame group there, and also you have the benifit of having 2 boardgame related conventions there. A big help could be the boardgamecafe podcast/youtube channel from snakes and lates, they make videos explaining all kind of things from a busines perspectave. (i think they coated the more expencive games with somthing for liquids). last time someone wanted to do a boardgaming renting service, it sounds great in theory but not great in practice, the boardgames i would want to ”rent” are the more expancive once, and what if you get one back that has mising pieces. and the cheap once i just buy. i think you realy need to work out the consept on paper befor doing annything, the bigest question being how manny visitors do you exspect and what would your revenue stream look like? most boardgamestores i know of are not only boardgame stores, simply becaus they cant life of only boardgames. and the once that do survive probebly becaus of magic or somthing similar. think about difrent senarios but try to keep it realistic. I’m lucky enough to live within minutes of Fantasy Flight’s Games Center in Minnesota in the United States. I’d say a quarter of the space is the store with the vast majority being open tables for gaming. They have all manner of beautiful terrain for miniatures games and a looong wall of demo copies of games. Additionally, there’s a full kitchen that serves up all manner of delicious food, plus they have an espresso bar, local beers on tap, wine, and all sorts of other refreshments. At the surface, this sounded like a horrible idea to me: mixing tabletop gaming with food and drink. To my pleasant surprise, everyone is super accountable for their consumption. They clean up after themselves and I’m yet to witness a spilled drink. I’ve also noticed a certain pattern to the range of customer that comes through the doors. Weekday evenings generally play host to the different categories of heavy enthusiasts. Wednesday Warhammer, for example, or D&D Tuesdays, Netrunner and Destiny on Mondays … that sort of thing. The “gamers” … the regulars. With these types you can rely on them coming in, ordering a meal, and more often than not expanding whatever it is they’re collecting. People hop up between X-Wing games, go to the wall, grab that new TIE fighter they just lost to off the shelf, relay their devastating defeat to the friendly staff as they buy it, crack it open, and go back to gaming. Weekends, however, seem to function very differently, with families and community events. It’s so awesome to see people not generally disposed to the hobby walk in for the first time and see their eyes go wide as they realize boardgames have become something more than just that aisle of Monopoly, Risk, Sorry, and Trouble at their department store. I was explaining the potential for teambuilding with a game of Captain SONAR to a lady and she stopped me to express how all of this is striking her as so amazing that she’s getting goosebumps! Another Saturday afternoon saw a whole troupe of pre-teen girls come in for a birthday, pick out the starter box for D&D, and within moments all be fully engaged in an adventure! It is my belief that games are an instinctive part of us – as much as storytelling or expressing our creativity through art. We’ve seen special effects and cinematic sophistication evolve over the years. So, to me, it makes sense that games have been evolving, too. Unlike movies, however, it seems the tabletop revolution has been happening under a lot of people’s noses. So I would encourage endeavors to expand the hobby, to open up shops, to expose people that would otherwise be unaware. Be friendly, open and generous, because to be host to opening someone up to this world is a great, great service! We’ve been there once and it’s an amazing place. When they realised we’re from the Netherlands they gave us some Netrunner promo’s (score!) and we bought way too much stuff :D. Hopefully we’ll be back someday! The best thing about FFGC for those of us who are a couple of rungs down from “regular board gamers” is that demo wall. It is a *serious* demo wall. And with three kids, it’s not even so much the expense as the time that it takes to play games, so it is great to be able to try a game a time or two first, to see if it’s something that is going to get a lot of replay-ability in our house (like DC Deck Building – the kids have played that one to the bone!) vs. something like King of Tokyo or Rampage, which they enjoy well enough but likely wouldn’t get played much if we bought it. Of course, you can’t do that with every game – something like Dice Masters doesn’t really lend itself as well to being on a demo-wall. Probably similar for Destiny (plus, it’s just hard to get!). 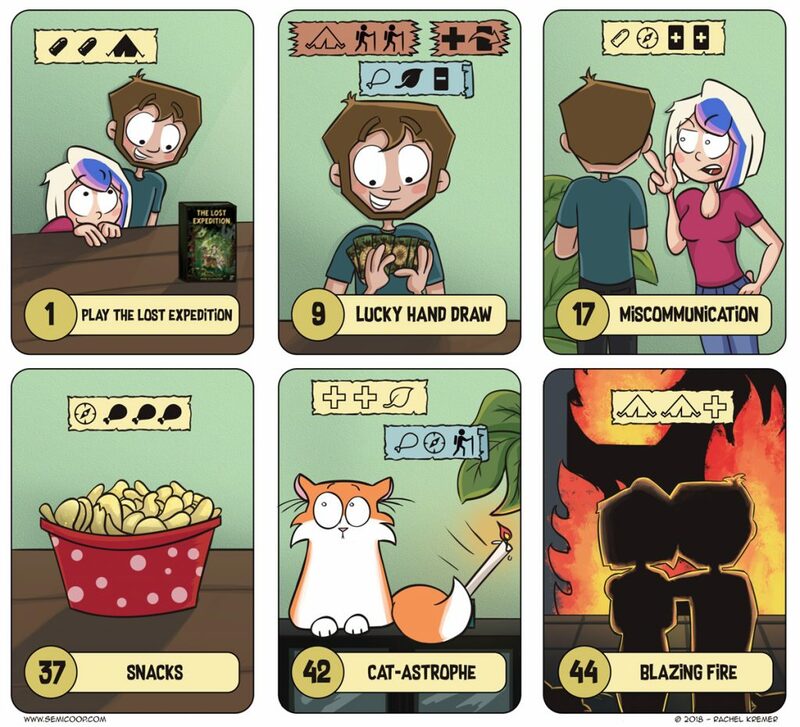 I don’t know what it’s like near you, but around here, if you can find the group of people who play (i.e., are addicted to) Dice Masters regularly, you can typically get a lot of extras from them for free, which is almost like demoing it. It’s a fairly affordable CCG model, and you can typically build pretty decent teams from the c/uc cast-offs from the veteran players. First thing I thought of was all of those cats trying to get into the boxes as people are setting up/playing. They’d scatter the pieces as they tried to get into the boxes first, of course. 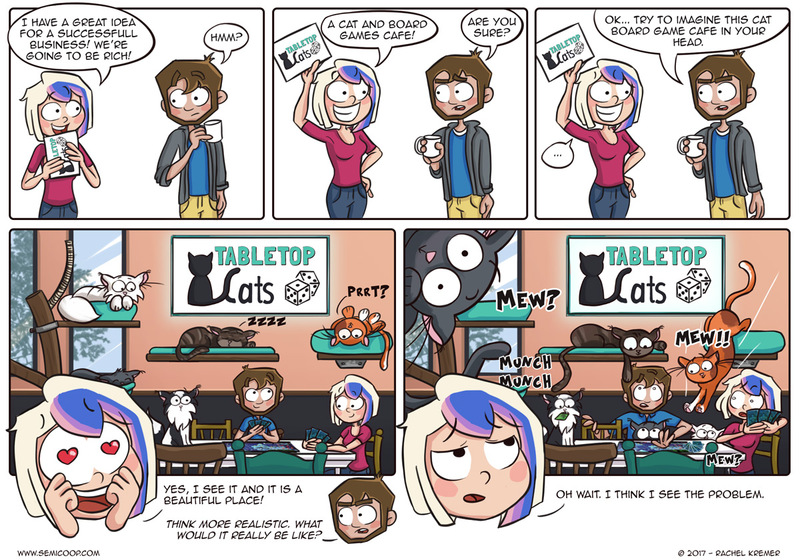 Funny concept and I’ve never heard of a “cat cafe” before. Never actually visited a board game cafe. I just found out there’s one within 30-40 miles of us, but that’s not exactly a convenient place for us to stop by. If I’m in the area, I’d be interested in visiting, but if/when we’re in that area it’s for some other event and we don’t have a lot of spare time for luxury stops. 🙂 I wish we’d get something in our area, but we’re not in the fastest-growing section of the metroplex so we’re out of luck for the moment. Were lucky to have the Boardwalk Boardgame Cafe in Abbotsford, BC now. Huge wall of categorized games. I’ve never seen anyone actually spill a drink, but you could bring your sippy cup to pour your drink into if your accident prone. Its about 45 min out of Vancouver. Near me there’s a very nice boardgame cafe with a sizable amount of games. Some of these are freely playable whereas for the bigger/expensive games you need to pay some amount of money (or have a membership card). That same membership card gives me a 10-15% discount on games at my FLGS as well, win-win.